If you’ve heard of the GRE, you’ve likely heard of the GMAT as well—though many do not know of the test’s exact purpose and how these two exams compare. The GMAT, also formally called the Graduate Management Admission Test, is an evaluation aimed at business school applicants. The test’s aim is, much like the GRE, to evaluate whether its takers possess the skills they will need to be able to perform adequately in graduate-level courses. These skills take multiple forms and will be at least slightly different from what you encountered in undergrad or high school. The business world is and has always been deeply competitive by nature. Doing well as a business owner depends not just on luck, but on having the right knowledge and skill set to keep a business going. This means knowing as much as possible about how to appeal to customers, how to network with other people in your chosen industry, and much more. No business owner entered the field knowing everything there is to know about how to run a business. Rather, they learned it either through formal education or on-the-job experience. The GMAT takes the requirements of the average post-graduate business curriculum in mind to test prospective students on whether they have the right skills to comprehend and excel in their program of choice. Since its creation, the GMAT has gained massive traction with programs across the globe as well as across the country. Hundreds of countries (and thousands of colleges) rely on the GMAT for their admissions. Hundreds of thousands of business school applicants—250,000 people per year, to be precise—sign up for and take the GMAT every year. Created in the year 1953, the GMAT is the brainchild of GMAC, or the Graduate Management Admission Council. The GMAT itself is split into four separate subjects: Verbal, Analytical Writing, Quantitative, and Integrated Reasoning. 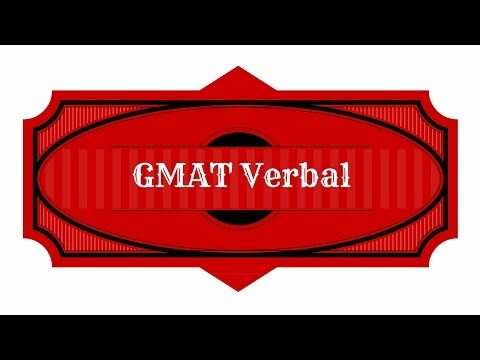 This overview will go over the Verbal section of the GMAT. With respect to the GMAT, “Verbal” knowledge is defined as the ability to read and interpret written information. It is very similar in format to the Reading Comprehension tests you’ve taken earlier on in your academic career, though the approach is a bit more advanced than early education standardized testing. As it stands, Verbal knowledge is highly important to maintaining a business career in that you will constantly be presented with written information related to your business—reports, proposals, reviews and testimonials (if your future business offers a product or service), and much more. You will have to know what these writings mean and how to respond to them accordingly through close reading and critical thinking. With enough studying and preparation, you should do just fine on the exam. You’ll have plenty of time to get ready to the fullest extent you need, as the GMAT is offered several times throughout the year. This gives you ample chances to study and plan how to approach the test by picking the most convenient testing date for you. Furthermore, you’ll find a wealth of tools to help you ace the GMAT on our website! This overview of the Verbal section of the GMAT will provide you with detailed information on how the test works—how it is formatted, what you will be expected to know, and how you can prepare to the best of your ability. You will also find a much more detailed GMAT Verbal study guide featured on this page. Should you need extra study help, you will also have access to a GMAT Verbal practice test and GMAT Verbal flashcards, which can be found elsewhere on our website. We are 100 percent dedicated to helping you succeed. This is why we try to provide you with every possible resource to help you as you prepare for this important exam. What Materials Can Be Found on the GMAT Verbal Section? The Verbal section is the final GMAT section you will take. Much like the Quantitative section, as well as the rest of the GMAT, the Verbal section is composed of multiple choice questions. You will be lent 75 minutes to answer 41 questions total. Unlike many other tests you’ve taken in the past, or even any sections featured on the GMAT, you will not have to aim for choosing the right answer on the Verbal section. Rather, you will only have to pick whichever answer is the most fitting. This should help when it comes to framing how you approach questions on the Verbal section, as you shouldn’t have to worry about accuracy so much as context. You will have to look at test questions and use the text to figure out which answer choice works the best, rather than which bits of information are the most relevant from an objective standpoint. We should point out, additionally, that since the GMAT is aimed toward aspiring graduate students who have already earned a bachelor’s degree, it is assumed that everyone taking the test is completely English fluent. If English is not your first language, we encourage you to study as much as you can by reading example texts and testing your deeper comprehension. Earlier we said that the GMAT Verbal section is comparable to other Reading Comprehension exams you may have taken in the past. However, the comparisons you could draw between them are very loose. It is worth noting that your basic knowledge of vocabulary will not be especially helpful when it comes to the Verbal section. You will not be asked to prove your capabilities with vocabulary and reading on a basic level. The Verbal section of the GMAT splits into three distinct sections: Sentence Correction, Reading Comprehension, and Critical Reasoning. You will be provided with scrap paper, much like you are with the Quantitative section of the test, for the sake of keeping track of what you’re reading and the information being presented to you. We will go over what you can expect from each of these knowledge categories and how you can approach and prepare for the questions featured under these subjects. Your ability to answer questions under the Sentence Correction category depends upon your knowledge of grammar conventions—specifically, consistency and subject-verb agreement. With questions under this category, you will be presented with an incomplete sentence with portions of it underlined. These underlined portions are what you will want to devote your attention to. Your answer choices will consist of ways to fill in these blanks in a way that makes sense to the reader. It will be your job to determine whether the underlined part of the sentence is the best possible fit, based on the context of the rest of the sentence. You can either choose one of four ways to edit the sentence into something more coherent, or decide the sentence needs no editing whatsoever. Keep in mind that your goal is only to create the most coherent sentence possible. Pick the answer choice that makes the most sense, rather than one than simply matches the sentence on grammar alone. You will more than likely run into several answers that “fit,” but only one that enhances the ideas presented in the sentence. Be sure to read the sentence carefully as you answer questions to make sure you fully understand the main idea of the sentence. You will need to study up on several grammatical conventions to do well on questions of this category—specifically, dangling modifiers, pronouns, and subject-verb agreement. It is a good idea to go back and review general grammar as you study to make sure you understand as much as possible. Do not try to rush through questions of this category, in spite of the time limit placed upon you. You want to make sure you choose the best possible answer, which will take some focus on your part. Some trial and error methods may be necessary with some answer choices to make sure you pick well. While the approach has changed somewhat, the presentation of the Reading Comprehension category of the Verbal section is the same as what you’ve encountered before. You will have to read short passages (totaling to a maximum of 350 words) and answer questions about their content—what they mean, how the information within them can be used to create conclusions, and how the different points or ideas relate to each other and unify the reading selection. There is no way to predict the amount of passages you will encounter as you work through this portion of the Verbal section of the GMAT. We cannot tell you the proper amount of questions to expect for every passage on the test, as this is completely randomized and will vary from passage to passage. You’ll find a number of different question varieties under this category. Some may ask you to think about the central idea of the text and what it could potentially be. A few questions will ask you to verify factual information. Others may ask you about hypothetical additions to the text and what ideas may be presented through these added paragraphs. Others still might ask you to draw conclusions based on what you have read. You may be presented with “trick answers” in the form of two choices that read very closely. Because of this, you’ll want to devote special attention to your answer choices. It is additionally worth noting that the passages on the test will cover a wide array of subjects, from business to the sciences. Do not worry if you see subject matters you have little experience with! You won’t have to know anything other than the skills already required of you for this particular exam. This means the only information you’ll be expected to know to answer Reading Comprehension questions is what will already be provided to you by the text. Similarly, if you do happen to possess intricate knowledge of a subject featured on this test, this knowledge will not help you with your answer choices. Only rely on the information given to you by the text passages. Again, be sure to read as carefully as possible as you navigate questions of this category. Because questions rely on you having read the passages, you want to make sure you absorb all of it. Some texts will be more difficult to read than others, so it’s okay to go back and reread as needed. If reading slowly and carefully more than once does not work for you, that’s just fine. Instead, you can skim on additional read throughs. Go through the questions and answer the easiest ones first. You can always go back through the text and decide on the best answer for harder questions by doing some more careful reading later on. Action Plan – Look at the action plan proposed by the text. How effective would this be if it were to be acted upon? How well would it serve the situation it seeks to solve? Argument Evaluation – How is the argument presented? What statements would make this argument flimsier? What would make the argument more effective? Argument Construction – What is the quality of the argument presented to you? Does the conclusion make sense depending on the evidence given? Is the evidence itself explained well, and does it tie in appropriately with the main argument of the text? It is worth noting that what you’re being asked to know for this portion of the Verbal section cannot be memorized or otherwise studied in the same way you would approach a traditional exam. Being able to answer these questions adequately requires a certain level of skill. It will be on you to pick up this skill and hone it enough to know how to approach questions under the Critical Reasoning category. The classes you took while pursuing your undergraduate degree will serve you well with this particular portion of the Verbal section, as much of your college classes likely involved some level of close reading of a wide variety of texts. The information we have provided you with here, about what sorts of questions will be asked of you under this knowledge category, should also help as you prepare for the test. Another way to tackle Critical Reasoning questions would be to read as carefully as you can. Take a glimpse at the questions prior to reading the full passage, then come back to the questions. Doing this will allow you to know just what to look for as you read, enabling you to answer questions more efficiently. It is a well known fact that the GMAT is one of the most difficult standardized tests in existence. However, there is much you can do to make it easier. First of all, you’ll want to read as much as you can as often as you can. The reading materials on the Verbal section of the GMAT will consist of a wide variety of subjects. Keeping this fact in mind, you will want to be exposed to a large assortment of texts. Get familiar with their phrasing and organization, as similar elements will appear in the reading passages given to you. Any prestigious publication is a wonderful place to start, especially those that are business-related. Furthermore, you will not just want to read, but to read closely. Really concentrate on the texts you consume, and consider how they’re written from a grammatical standpoint and a more critical one. Look at the grammar and, even more importantly, the argument being posed in the text. Pick out what the text’s central point is and think about how evidence is used to build it up. Doing this on a consistent basis will transform you into a Verbal section pro! We hope this GMAT Verbal section overview will serve you well as you prepare to take this exam. While it is not 100 percent comprehensive, it is our goal with this overview to provide you with enough information to formulate a thorough study plan for the exam. For further help, you can consult the GMAT Verbal study guide also featured on this page, as well as our GMAT Verbal flashcards and GMAT Verbal practice test.